Welcome to Hacking Chinese Challenges! The concept is simple. 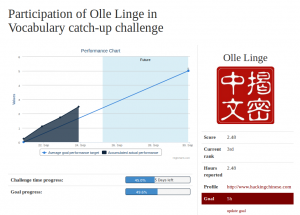 Each month, there will be a challenge focusing on one particular area of learning Chinese, where you strive to reach your goal and/or beat your friends. The challenges are very straightforward: set a goal, study as much as you can, log your activity and make sure you reach your goal before the end of the month. To make sure we diversify our studying, I have worked out a schedule and will cycle different types of challenges. You can join all the challenges and get a lot of everything or just join those that happen to be aligned with your current plans, it’s up to you. If you join all the challenges, I will make sure that the proportions make sense, so even if there will be some special/unique/interesting challenges, most will just be very useful. Once you have registered, you can join challenges, set goals and report progress. Please note that this month’s challenge will start on Friday, so even if you can enrol now, you can’t start reporting progress before Friday. I will write more about this month’s challenge on Thursday and will also post some suggested resources early next week. I have included more specific instructions on how to use Hacking Chinese Challenges below, but let’s look at the schedule first. I will update this as I come up with new challenges or if I decide to include reader suggestions. Leave a comment if you have ideas for challenges! There will be one challenge each month that will last for roughly three weeks, always starting on a weekday and ending on the last day of the month. Three weeks is enough to stay focused and achieve a lot, but not so long that you tire and get distracted. You also get one week breathing space between each challenge. Each challenge will be preceded by a post on Hacking Chinese where I introduce the challenge and share some relevant articles and resources (you can always go to Hacking Chinese Resources). Let’s help each other out and share tips, information and resources for each challenge! I like challenges a lot and I think it’s an excellent way to stay focused, especially for learners who aren’t taking courses but still want to improve. My hope is that if you commit to these challenges, you’ll get more done. I have participated in several reading challenges (this project is inspired by Read More or Die) and I typically read more than twice as much when I’m in a challenge compared to when I’m not! I want to use this power not only for reading, but for all areas of language learning. And I want you to join me. I plan to enrol in all challenges myself and I came up with the idea partly because I need this badly myself. This is a beta version. It has been through some testing before this (I ran a listening challenge with volunteers from the e-mail list as well as a short vocabulary challenge with people from Facebook). However, there are likely still occasional quirks and bugs. This is a work in progress and if you have any feedback or comments, please let me know! Just as for Hacking Chinese Resources, I’m not responsible for the coding on this project. Instead I have relied on the invaluable help of Stefan Wienert, thank you! I have also received a lot of help from Julien Leyre of the Marco Polo Project. I’m going to tell you more about the October challenge this Thursday, but if you want to start now, you could prepare yourself by enrolling in the challenge and finding as much listening material as you can. I’m going to talk much more about this later, but try to find audio that is at or below your level. See you again on Thursday! Hi Olle! Is this limited to Chinese? I’m learning Japanese which is similar in all the areas of practice mentioned, and I’d love to participate. Great! That´s the exact question I had. I´m studying Spanish and I was wishing there was something like this for Spanish. I´m glad I can participate in the challenges as well. Can´t wait to join. Thanks for allowing us to participate.